96 pages, 8-3/8 x 12"
More than 100 full-color illustrations. The author is the world's foremost authority on Chartres, and is in residence there most of the year. He shows us the history of the cathedral and teaches us how to "read" the world-famous stained glass and sculpture, explaining the references to Scripture and the teachings of the Church. Chartres alone, of all the great medieval churches, has survived into the 20th century almost intact, not only architecturally but with its vast inconographic program in 12th-and 13th-century stained glass and sculpture. Medieval art was intended not just to embellish the church but to instruct the people, for there was no printing. Scholars could therefore teach their students, the clergy preach sermons and parents read the lives of the saints to their children using the 'texts' in stained glass and sculpture. The sister churches of Chartres have been sadly vandalized to varying degrees by Reform, revolution, war or natural disaster. Here in Chartres the 'text' is virtually complete. 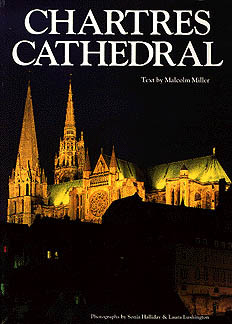 A concise glossary of symbolic images has been included as well as a complete plan of all the windows in the cathedral, and an index.